General Surgeon - Robert Thomas, MD - Bond Clinic, PA Bond Clinic, P.A. 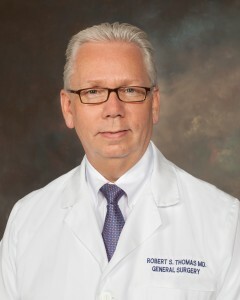 General Surgeon – Robert Thomas, MD has been engaged in the practice of general surgery and surgical oncology since 1988. He is board certified in Surgery and fellowship trained in Surgical Oncology. Dr. Thomas treats patients with a variety of surgical conditions including benign and malignant diseases of the breast, intestines, soft tissues and gallbladder as well as all types of hernias. He has experience in the use of advanced laparoscopic and robotic techniques to manage these conditions. Most recently, Dr. Thomas has been offering robotic-assisted single-site gallbladder surgery which offers patients the advantage of having their gallbladder surgery through a single one-inch incision at the umbilicus while still going home on the same day.